This book presents the first analysis and critique of the idea of practice as it has developed in the various theoretical traditions of the social sciences and the humanities. The concept of a practice, understood broadly as a tacit possession that is 'shared' by and the same for different people, has a fatal difficulty, the author argues. This object must in some way be transmitted, 'reproduced', in Bourdieu's famous phrase, in different persons. But there is no plausible mechanism by which such a process occurs. The historical uses of the concept, from Durkheim to Kripke's version of Wittgenstein, provide examples of the contortions that thinkers have been forced into by this problem, and show the ultimate implausibility of the idea of the interpersonal transmission of these supposed objects. Without the notion of 'sameness' the concept of practice collapses into the concept of habit. The conclusion sketches a picture of what happens when we do without the notion of a shared practice, and how this bears on social theory and philosophy. It explains why social theory cannot get beyond the stage of constructing fuzzy analogies, and why the standard constructions of the contemporary philosophical problem of relativism depend upon this defective notion. 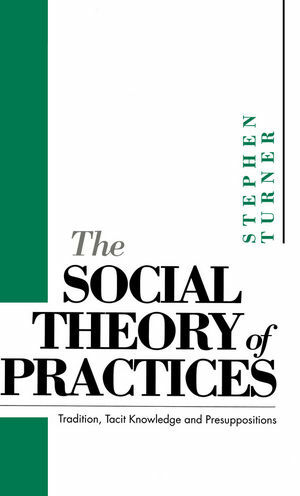 Stephen Turner is the author of several previous books including The Search for a Methodology of Social Science and Sociological Analysis as Translation. 1. Practices and their Conceptual Kin. 6. The Opacity of Practice. * Discusses some of the most prominent questions in social theory today. * Offers original analysis of the concept of social practice and its importance in social analysis. * Provides a critique of Bourdieu and other leading thinkers.